You can now see a more detailed version of my story on my blog divided into different blogs. I am an author with 3 books out. You may be familiar with my first, “Sugar and Salt.” If you are intertested in reviewing my third, “Reboot, A Novel of Bipolar Disorder,” please send me an address and I will ship you a book. I apologize, but I never saw this comment. Thanks for your encouraging words. hi! please check out my blog you me and that bipolar thing. I am new to blogging so be gentle. 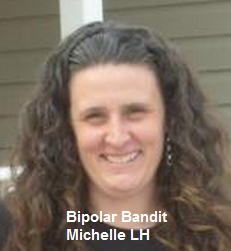 i just want to help people learn first hand what its like to have bipolar disorder. I really like your article that you just posted! keep up the good work! Wow! I think you have a great start!!! I think anything you can do to explain Bipolar Disorder and share your stories and experiences, is great. You will touch lives. I think the graphics and over all appearance is great too. I shared your blog on one of my Pinterest boards. http://www.pinterest.com/pin/405886985138738789/ If you ever want to write a blog to share on my blog, write to bipolarbandit@gmail.com Subject: Blog Submission You can include information about your blog, social media sites, etc to get the word out about your blog. Keep up the great work. As the mother of an adult son with bipolar disorder, I applaud your courage and your efforts to de-stigmatize this crippling syndrome. Please keep it up. I will be following and sharing, especially with my son. Thanks for your encouraging words. It sounds like your son is lucky to have a mother like you. Thank you for this blog. I found it while doing some research for my own blog (MoodSurfing.com) which is about coping creatively with moods. If it is OK with you I would like to include a link to your site on my blog. And if you felt it worth putting in a good word for mine that would be great too. You are welcome to share my blog. I shared your blog on Pinterest http://www.pinterest.com/pin/405886985137962866/ and liked you on FB. This information is also very useful. MENTAL HEALTH ON DEMAND with a CENSUS OF TRUE INTENT.